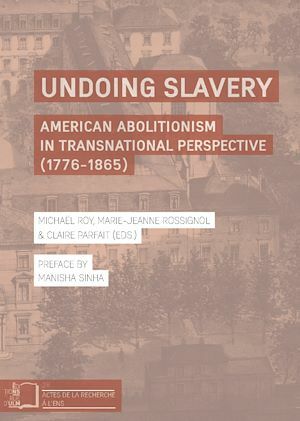 Undoing Slavery : American Abolitionism in Transnational Perspective (1776-1865) is a collection of seven essays by leading and emerging scholars of abolition in France. Contributors to the volume situate American abolitionism in a transnational framework, pointing out how slaves running away to Canada, free African Americans emigrating to Haiti and activists meeting in a Paris salon all influenced the fate of slavery in the United States. In the wake of recent historiographical trends, they extend not only the geography but also the chronology of abolitionism, attending to its development and evolutions over the longue durée. Special emphasis is also placed on the varied print culture of abolition, from antislavery novels, newspapers, gift books and almanacs to black-authored pamphlets and printed orations on the abolition of the slave trade. Undoing Slavery is prefaced by Manisha Sinha, author of the award-winning The Slave’s Cause: A History of Abolition.